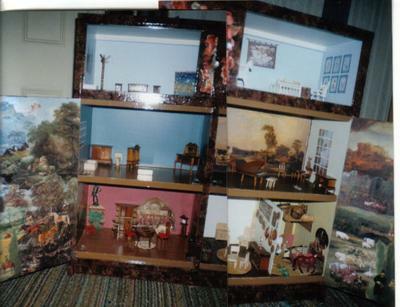 When I first wanted a dolls house! I always wanted a doll house and never got one as a child, so in 1999 I decided to make one of my own. 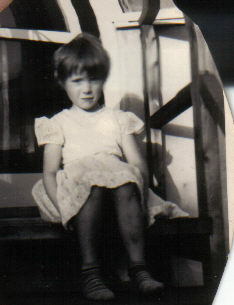 I had started learning how to decoupage, by decorating metal biscuit tins, and wall screens. So I took an old kitchen cupboard I was using in the office, and converted it into my doll house! 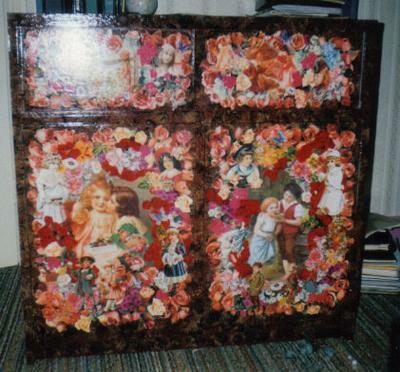 Then I decided to decorate the front in the style of the wall panels and the wardrobe I had done, with images of people embedded in flowers. And I also wanted the inside of the doors to open up and create the 'garden' and countryside of the doll house, so that below it I could have the farm animals and kitchen gardens as well. So now the house is framed by the landscape - nice look, I think! It still has a long way to go to be completely decorated, and to create the farm kitchen gardens etc. but I have been busy with building a business for the past 20 years. But now I am retiring from all that in 2013 so that is one of the craft projects I want to go back to and complete. I'll post more pictures here later when that's done. What I do find amusing about this doll house is that BOYS have even more fun with it than the girls! Don't know why, but boys love playing with this doll house! Go figure.